As you know, I am constantly patrolling my site collections because they are starting to get full. One of the storage space eaters are documents with many versions. The ability to keep document versions is a very useful functionality, but it can also be a pain. Every version, major or minor, takes up as much space as the current document, at least in my SharePoint version. 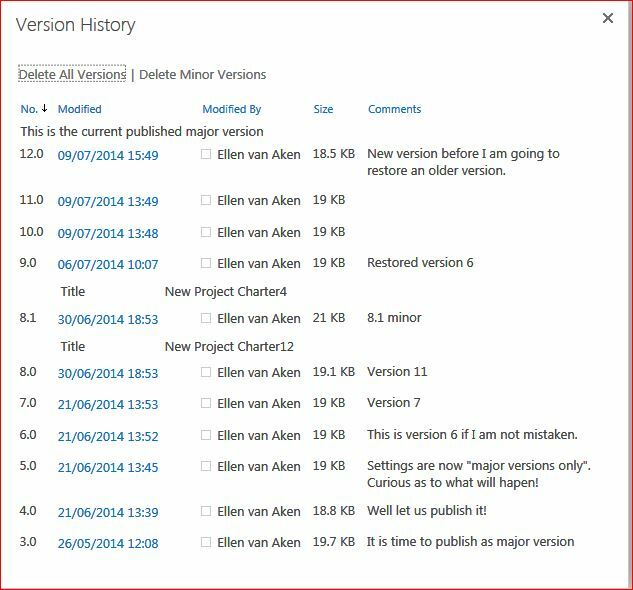 SharePoint 2013 is reported to only store the differences in versions, so a document with versions will use less space. I assume you know the basics about how to enable versioning – if not this may be helpful. I have learned a couple of things recently. 1. 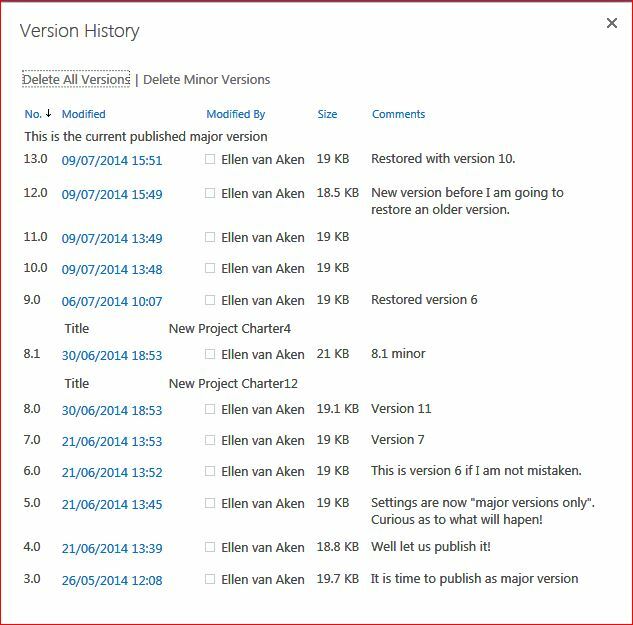 Every action on a document (except Read) creates a version (if versioning is enabled). Jasper Oosterveld has explained that here. 2. Many people do not understand the difference between major and minor versions. I have seen a document at version 0.256 that was supposed to be the final document. When I asked the owner about the reason for the minor versions, and why the document was never published as a major version, he told me “I do not know, it is the way we all work”. Now, I make it a point to teach people to use only major versions, and to use minor versions only when there is a publishing cycle (updating and approving) in place. Is “Content Approval” set, is there an approval workflow installed, are there any signs of a process? If not, I suggest owners to limit the versioning to 3 major versions, just to avoid accidents with overwriting. 3. 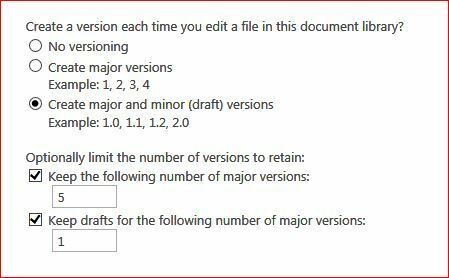 Versions do not disappear until you edit the document or manually remove the versions. If you go from “”unlimited” major versions to 10 major versions, the documents in your library will keep their 10+ versions until you edit the documents or their properties. So that old document, “Production planning wk. 21, 2011”, with 56 versions, will keep its versions until you edit the document. But…this document will likely not be edited anymore, so even if you limit versioning, the versions stay there forever. I make it a habit of removing all but 3 versions of these documents manually (in the Version History) whenever I find them. I am also thinking about a workflow to do this for all documents in a library. 4. Versions do not disappear when you set versioning to “No versioning”. Suppose you have a document library with versioning set to 10 major versions and you change the settings to “no versioning”. Then you edit a document with number 8.0. You edits to the document will result in version number 9.0, 10.0 etc. without keeping versions 8.0 and later. However, your versions 1.0 up to 7.0 will still exist. You can see that if you turn versioning on again. 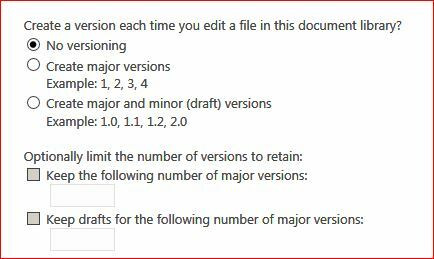 It is better to limit major versions to 1, because then all superfluous versions will be removed when you edit the document. 5. Versions that are being removed manually go via the Recycle Bin. If you open a document’s version history and select “Delete all versions” or “Delete minor versions”, those versions end up in the deleter’s Recycle Bin, so they can be easily restored. It also means they will keep adding to the Storage Space Allocation until they are moved to the Admin Recycle Bin. Click “Delete all versions” or “Delete minor versions” manually. 6. Versions that are removed because they exceed the set limit after editing DO NOT go via the Recycle Bin. 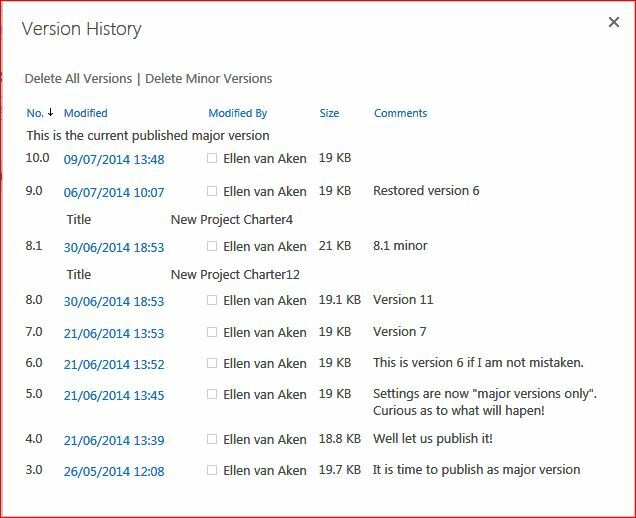 So, if you change versioning settings from 10 major versions to 3 major versions, and then edit a document with 10 versions, the 8 exceeding versions will be deleted permanently and can not be retrieved. 7. If you “cut and paste” a document, all versions will be retained. I learned this and the next one from Popescu Andrei Vlad on LinkedIn. If you use the Explorer View to move content between libraries, be careful. If you need to keep versioning, use “cut and paste”, otherwise you will lose the versioning. Make sure you have versioning enabled in the target document library! Moving a site within the site collection via “Content and Structure” also retains versions. 8. If you “copy and paste” a document, you will start with version 0.1. So, when you are archiving content, or if you want to get rid of the versions using the Explorer View, “copy and paste” is better, because you will remove all versions, even if you have versioning enabled. This also works when you copy a site withint the site collection via “Content and Structure”. I still have to test if it works the same if you use a 3rd-party-tool to move content, such as Content Matrix. 9. Minor versions can not be limited. Now look at the description carefully. You would expect that the second square box would mean the same thing as the first one: a limitation to the number of versions. But it says you can limit the number of major versions that have minor versions. That is something else altogether. Please read the description next to the 2nd square box carefully. It does not say that you limit minor versions. The second box should therefore always contain a lower number than the first box. I usually suggest to use minor versions on 1 major version. This means that, whenever the last version with number x.1, x.2, x.3 is turned into a major version x+1.0, the minor versions are removed. That makes sense because document drafts are generally no longer relevant once the document is published. My preferred versioning settings for libraries with a publishing process. But even a limit of minor versions to 1 major does not mean you are out of trouble, because document 10.176 is still a possibility. If the document is never published to a major version, those versions will be using space forever. 10. When your restore an earlier version, this will be added as a new version. So if you want to replace your current version 12.0 by older version 10.0, you have the choice of adding it as 12.1 or 13.0. This is the version history before I will restore version 10.0 as the current version. After checking out the file, going to the Version History again and clicking on Version 10.0, I can restore it. Version 12.1 (added by checking out) will be overwritten by Version 10.0 and be called 12.1. When checking in again, I can choose between saving it as 12.1 or 13.0. I have selected 13.0 in the example. After restoring version 10.0 as the current version, it will be version 13.0. All versions in between are stored as well. And you see versions 10.0, 11.0 and 12.0 are kept as well. So restoring a version will create a new one, not remove the in-between versions. Once versioning is enabled, your document library may grow in unexpected ways. It can be harder to get rid of versions than you may have expected! Have I missed something? Do you know more “gotchas”? Please share!